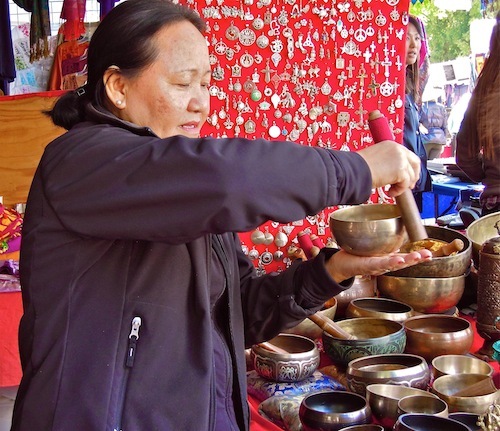 Last weekend, Berkeley’s Himalayan Fair turned Live Oak Park into a carnival of color, where throngs of dancers (both onstage and off) shimmied to hypnotic live music and shoppers blissfully perused booths overflowing with Buddhas, jewelry, and scarves. The longest line, however, waited patiently for plates of a tasty Tibetan specialty, simple snowy dumplings called momos. An almost universal foodstuff, the family of stuffed dumplings appears in scores of cuisines, with an array of accents. Like swaddled infants, these babies are encased in a range of wrappings, folded with a variety of techniques, depending on the culture. Warm round or crescent-shaped packages encase a nugget of meat, vegetable or cheese in a comforting embrace. Ravioli, kreplach, wonton, gyoza, pot stickers, Korean mandu, Turkish mantu, Polish pierogi, Ukrainian varenyky and Russian pelmeni, to name only a few. 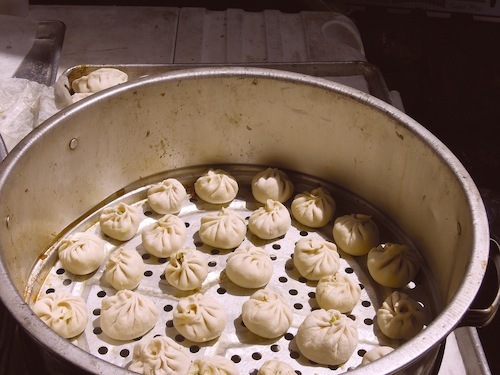 Steamed momos are a mainstay of Tibetan culture, where they were originally stuffed with yak meat and now more often filled with a beef or vegetable mixture and served with spicy tomato chutney. The hot steam used for cooking trays of momos serves a dual purpose and warms the living space between batches. 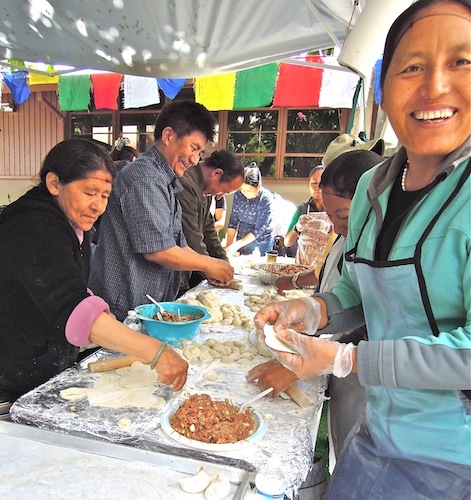 Although it is possible for a single person to fashion a mountain of momos, the labor-intensive process lends itself to group collaboration and conviviality. At the Himalayan Fair, a fundraising event since 1984, the momo station was sponsored by the Tibetan Association of Northern California. 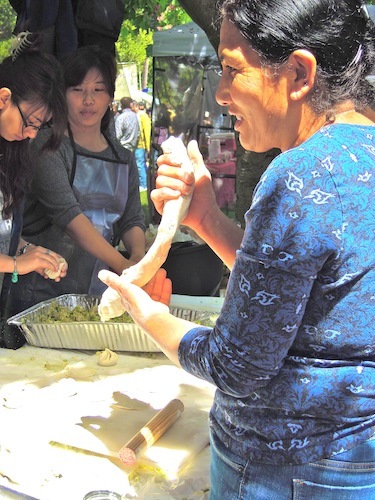 Its members (men and women of all ages) amiably worked together to knead the flour and water dough, pull it into a thick snake, pinch off chunks, roll them into circles, and fill and fold scores of dumplings into two classic shapes. A purse-like sac with swirly pleats at the top encased a vegan mixture of cabbage, onions, garlic, chives, mushrooms, celery and cilantro, while half-moon crescents held the savory beef and onion filling. The finished dumplings were steamed in large, stacking trays and gobbled up by waiting customers as soon as they were done. The fiery chutney and dressed greens perfectly counterbalanced the understated, homey dumplings. If you don’t want to trek up a steep Himalayan peak or wait until next year’s Fair to sample this Tibetan delicacy, the East Bay is home to several eateries that feature momos in lamb, chicken or vegetarian varieties. 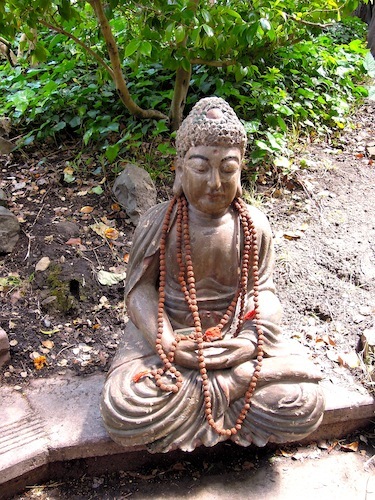 In Buddhist practice, Tibetan singing bowls, which date back thousands of years, are used to signal the beginning and end of meditation.. Their harmonic vibrations have been shown to induce relaxation. 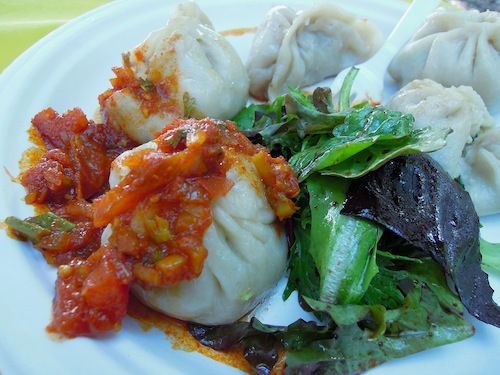 This entry was posted in Tibetan food and tagged dumplings, Himalayan Fair, momos, Tibetan food. Bookmark the permalink. Thank you, Yvette for pointing that out. I will have to try it.